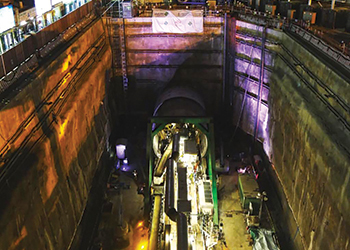 Launch of tunnelling works on the 41.2-km Riyadh Metro line. Italy’s Salini Impregilo has significantly increased its projects footprint in the Gulf with major two contracts worth a total of well over $1 billion secured in quick succession in Qatar, as it marks a key milestone on the Riyadh Metro – one of its recent successes in the region. 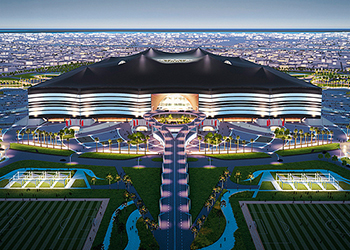 Under a €770-million ($859 million) deal, the Italian contracting firm has taken on the responsibility for constructing the Al Bayt stadium in Al Khor, 50 km north of capital Doha, along with its joint venture partners Galfar and Cimolai. Some €716 million ($800 million) of the value of the contract goes towards construction and more than €53 million ($59.2 million) for operation and maintenance for the sports complex where the 2022 Fifa World Cup final is to be played. The consortium beat many competitors from France, Austria, India, and Asia in an international competition which lasted several months. The scope of work includes the construction of a stadium which can accommodate 70,000 spectators over an area of 200,000 sq m; an auxiliary building for security and administrative offices, and a centre that will house electromechanical services. The project was awarded by the Aspire Zone, a governmental organisation responsible for the development of sports infrastructure in the country. Among other things, the contractors will be offering solutions to provide optimum climatic conditions inside the stadium both for the players and spectators. “The project is a sustainable one, thanks to the use of modern construction techniques and environment-friendly and low energy impact advanced materials,” says the spokesman. Salini Impregilo has also won a contract for the construction of primary urban infrastructure in Shamal, a residential area located 100 km from Doha. The company forms part of a consortium with Bin Omran of Qatar that won over three competitor consortiums from the Gulf area, Asia and the US. The entire residential development covers 1,043 hectares and is connected to Doha through the North Road. The €300-million ($327 million) project, which is expected to be completed in 30 months, is part of the Local Roads and Drainage Programme (LR&DP) and has been awarded by Qatar’s Public Works Authority (Ashghal). The consortium’s scope of works includes Package One, which covers 25 per cent of the area to be developed. It also includes the roads and infrastructure for Al Zubara district in the western area, the northern section of the central district of Abu Al Dholouf, and the southern area of Al Shamal. Also part of the job is the planning and design of the microtunnelling and irrigation systems. With these new contracts, Salini Impregilo has strengthened its presence in Qatar, where it is already working on the €1.7-billion ($1.85 billion) Doha Metro’s Red Line North project and the Abu Hamour water system project. Meanwhile, as leader of the ArRiyadh New Mobility (ANM) consortium, Salini Impregilo recently marked the launch of tunnelling works on its section of the Riyadh Metro. In July, Riyadh Governor Prince Faisal bin Bandar officially launched the giant tunnel boring machine (TBM) named Jazlah to be used on the 41.2-km Orange Line – Line Three of the project. Jazlah, 10 m in diameter and weighing 700 tonnes, started boring on the 5.8-km tunnel in the downtown of Riyadh and will pass through the Riyadh main train station. The route is mostly elevated along the western part of Al Madinah Al Munawwarah Road, underground in bored and mined tunnels in the central section of the line, and generally at-grade along Prince Saad Ibn Abdulrahman Road in the east. The line features 22 stations including the two iconic stations named Qasr Al Hokm and Western, designed by Snohetta and Omrania respectively. The line also includes also six ‘Park&Ride’ facilities that will contribute in the future to the integration between transportation systems. Headquartered in Italy, Salini Impregilo is a global player in the construction of major infrastructure, specialising in dams and hydroelectric plants, railways, metro systems, roads and motorways. The group, which was founded on January 1, 2014, combines the experiences of two well-established and consolidated companies, Salini and Impregilo, which have more than a century of experience. The group today operates in more than 50 countries across five continents with 34,400 employees. Its turnover at the end of last year was €4.2 billion ($4.7 billion) with a backlog of €32 billion ($35.7 billion).